(Photo: German Villasenor / Team Margarito) By Dan Ambrose: For fans of former IBF/WBA/WBO welterweight champion Antonio Margarito (38-8, 27 KOs), they’ll be able to get their fix with him, as he’s going to be returning to the ring this Saturday night in a fight against Jorge Paez Jr. (39-7-2, 23 KOs) at the Arena Ciudad de Mexico, in Mexico City, Mexico. Margarito, 37, hasn’t fought since losing to Miguel Cotto by a 10th round stoppage in December 2011. The Margarito-Paez Jr. fight will be televised on beIN SPORTS en Español. This will be an interesting fight to see for boxing fans curious about whether Margarito has anything left after all these years. Five years is a long time for a fighter to be out of the sport and it’s very hard to imagine Margarito having anything left at this point to be a factor in the sport. The idea is for Margarito to beat Paez, and then promoter Bob Arum of Top Rank could have a bigger fight for him after this. Just how much bigger is unclear. That’ll depend largely on what Margarito looks like on Saturday night against Paez Jr.
It’s quite possible that Margarito could lose this fight because he’s not fought in ages, and he looked incredibly poor in three out of his last four fights against Cotto, Manny Pacquiao and Shane Mosley. Margarito looked like a shot fighter in those fights. His hand speed looked to have gotten worse, and his punching power was no longer enough to dominate. What has to be a concern for Margarito’s fight against Paez Jr. is whether Margarito’s surgically repaired right eye will hold up from the pounding that it’ll endure. Paez Jr. hasn’t said that he’ll target the eye intentionally, but you have to figure that the eye will be hit quite a bit in the fight. Margarito suffered a fractured right orbital bone in his 12 round decision loss to Manny Pacquiao in 2010. The fight should have been stopped early one when Margarito’s eye began to show signs of being badly damaged, but Margarito bravely stuck it out and took a bad beating. 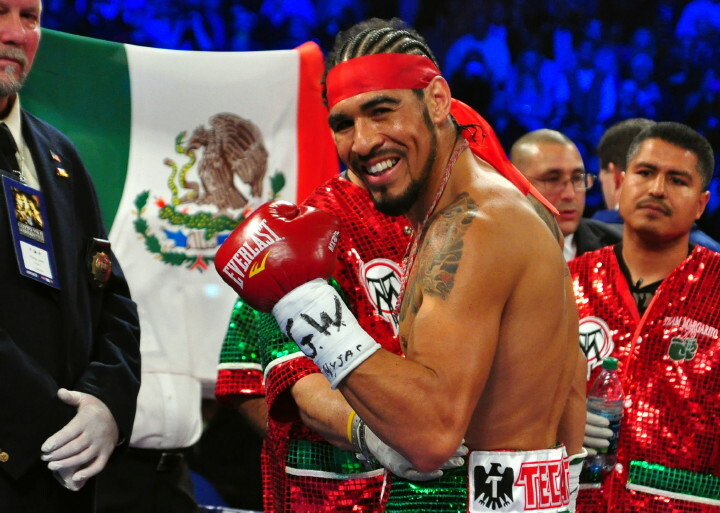 Margarito had to undergo surgery after the fight to repair the problem. All total, it took three surgeries to repair the problem. Margarito plans on fighting in the welterweight division rather than attempting to fight at 154, which is probably where he should be fighting. At 5’11”, Margarito will have the height and reach advantage over most of his opponents in the 147lb division. If he can still throw punches at a high rate, then he’ll have an advantage in that area as well. Where Margarito won’t have an advantage is in the hand speed, youth and possibly the power advantage. He was slow of hand in his prime, but he looked like he had gotten worse by the final three fights of his career. Margarito’s punching power had abandoned him as well, and I don’t think his power is going to come back. Without speed, power and youth, Margarito’s chances of finding success in his comeback will be almost zero.